You'll love this charming, impeccably maintained 2-story cottage style home which has a modern farmhouse vibe. 3 bedrooms, 2.5 bath home with apprx 2800 sq ft of generous living space. 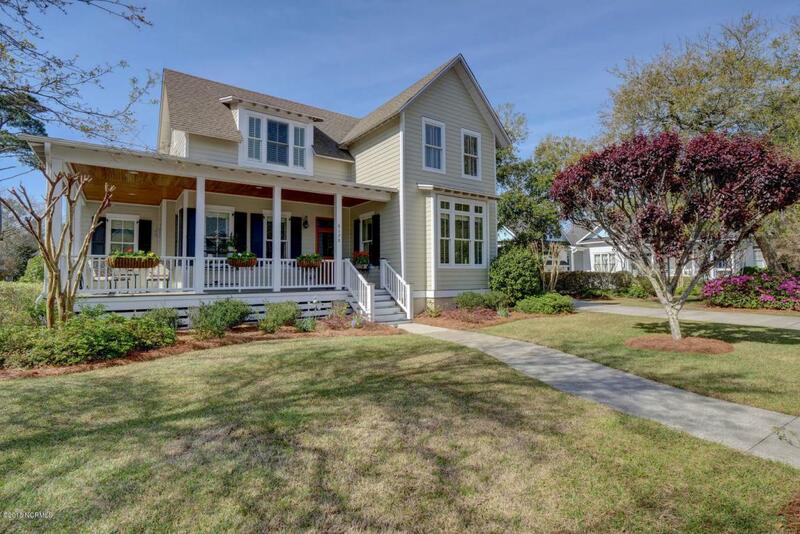 Situated in the lovely waterfront community of the Landing in Southport it is minutes from shopping, restaurants, Historic waterfront, walk to ferry-Marina for Bald Head Island and Wilmington. Open-concept design,10-foot-high ceilings, and the abundance of windows give this home an open, airy feel. With combined elements of days gone by and current trends it has a sought after coastal character. Greeted by the wrap around front porch you will enter the foyer where oak hardwoods traverse the living area. Chef's kitchen with quartz countertops, upscale custom cabinetry, gorgeous island with built ins &stainless steel appliances opening to the family friendly functionality of the huge dining area. The master bedroom is conveniently located on the main level and offers a wonderful spa-like bath, and an oversized walk-in closet, sitting area that looks out to porch. First floor study with double windows frame the dogwood tree beyond like a Spring time painting. Upstairs there are two additional guest bedrooms, loft with built in window bench seats. Shared bath with a recent gorgeous renovation. Laundry room, Inviting back screened porch overlooks private fenced backyard with secret garden, beautifully landscaped with irrigation system, Oversized two car Garage with room above for extra storage. The detail is in the finish work; baseboards, crown moldings, and decorative lighting, The Curb appeal and southern charm will be hard to resist!